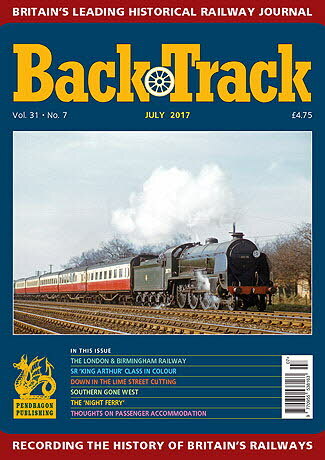 Railway Magazine | BackTrack July 2017 journal from Pendragon Publishing. This edition of BackTrack has been made available for downloading. Each article and feature has been made into a PDF file which can be downloaded and viewed in Adobe Reader or other PDF readers. If you do not have the Reader see below for how to obtain it. In order to reduce the download times the resolution of the pictures have been reduced, this reduces the quality of the photographs compared with the paper copy of the journal. Even with these reductions the sizes of several of the files are large. On a 2Mgbps broadband link it typically takes 10-20 seconds for many of the articles to download before the first page displays. For dial up links it may take several minutes. This sample shows the type, range and quality of the articles which appear in the magazine each month. This is typical of the monthly journal. In the magazine some of the articles cover several pages and the titles span two pages. Page numbers start at 1 in the January edition each year and are numbered sequentially during the year, so this July editions starts at no. 385. You can either load an individual article or the whole journal. The 'Night Ferry' - two articles by Arnold Tortorella on how its introduction was reported in 'The Times' and Allan Trotter on the final years of the service. The Men from the Ministry - George Smith presents an account of a visit in 1826 by two Prussian engineers to learn about Britain's developing railways. The Southern Gone West: Plymouth and its Branches - Part One - David Thrower describes how the GWR and LSWR came to Plymouth. 'Knights of the Southern Lands - five pages of colour of the famous SR 'King Arthur' 4-6-0s. Down in the Lime Street Cuttings - John C. Hughes presents an illustrated view of the cuttings and tunnels taking the railway out of Liverpool's famous station. The Marshall Meadows Tunnel Railway near Berwick-upon-Tweed - Roger Jermy uncovers a little-known industrial line on the Northumberland coast. Atlantic Journeys - archive photos of 4-4-2 locomotives from six different companies. On the London & Birmingham Line - four colour pages of latter-day steam on Britain's first trunk main line. The Formative Years of the London & Birmingham Railway 1832-8: Part One - described by Jeffrey Wells. The Great Western in Wirral: Part Two - Tony Robinson concludes his account of the GWR's route to the Mersey, ending with the demise of the Paddingtonâ€"Birkenhead service in 1967. Colonel Howard G. Hill and his two locomotives - David Harris introduces the man behind the American wartime 2-8-2 and 0-6-0T locomotives. Some thoughts on Passenger Accommodation - a review of 'passenger experience' by Alistair F. Nisbet. A Suffolk Tragedy - John D. Mann recalls a 1936 visit to the closed Southwold Railway. If you do not have Adobe Acrobat you can download it free from Adobe.